Brick to Click Farewell Benny’s | Millenium Consulting, Inc. Brick to Click Can we harness the power? Benny’s Benny’s, Is My Fav-o-rite Store. That catchy tune and those adorable children will be etched in our memory. 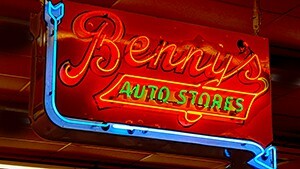 Benny’s, founded by Benjamin “Benny” Bromberg nearly 93 years ago is a piece of Rhode Island culture that will be sadly missed. Technology is clearly dominating retail, yet we do well to examine ways to harness its power. The privately-owned, 32-store, RI icon closing its doors came as a shock. It brings into question what is the future of ma and pa business, retail in general and our own state’s culture. Benny’s takes its place alongside Rocky Point, Custy’s, (remember this “All the lobster you can eat” buffet? ), Crescent Park, The Outlet, Shepherds and so many others. While we continue to stuff ourselves with Wright’s Farm Chicken, drink our Coffee Milk, and clean stores out of milk and bread at the hint of a snowstorm; sadly, we will no longer run to Benny’s and pick up windshield wipers on-the-cheap complete with installation. Gone is the Christmas toy layaway that helped so many families make that morning magical. The friendly neighborhood store that had virtually everything including a warm greeting and sincere helpfulness is a thing of the past. Rhode Island is unique. Along with a lengthy list of landmarks, history, and customs, Rhode Islanders weather the fierce winters, high taxes, and annoying politics because we love our special state. A place with beautiful beaches, wonderful restaurants, seafood and of course, the bazaar. The world’s largest bug is on the roof of Big Blue Bug Solutions in Providence. The termite, 58 feet long, is a landmark proudly wearing a Rudolph red nose when the holiday season rolls around. Nibbles Woodaway is clearly seen from Interstate 95. Did you hear we set the river on fire while thousands of people stand by and watch? Rhode Island has seen its share of sad goodbyes to places that live on in our childhood memories. Change is inevitable and clearly retail is destined for more than its fair share. Growing dominance of online and mobile buying has the retail landscape spinning. Technology is and will continue to be its catalyst of change. Prime real estate that once held big mall anchor stores is fast becoming the ghost town of the 21st century. This doesn’t mean the providers of “stuff” are going away. Retail is surging on technology, striving to target messaging and create a unique personalized shopping experience and they are looking for innovative ways to do it. A clear focus is on the harnessing of Big Data and carrying out the analytics to reveal and predict consumer habits. Perhaps we will see driverless delivery vehicles, drive-through pick-up locations or visual search -Take a picture of something you’ve seen in a magazine, with a technology like Slyce and the swipe of a finger, you find it. Jobs in retail will belong to the tech-savvy. It’s critical that we bring computer science into our schools and prepare our children for the new job market. The future isn’t very far off. High school students today are poised to name their price in this new workplace. For our old friends at Benny’s, check out Tech Force Rhode Island. http://techforceri.org/ They have many great programs to help you to evolve into the technology arena. RI Department of Labor and Training has funding to help as well. Thank you for the great years of service and we look forward to seeing you on the tech train.